I went to this gig with a mate from Scarborough called Ian Ferguson. Where are you now, Fergie ? Why not get in touch. Badger opened up really well, I still have " One Live Badger ". Anyway, what I remember is the quadrophonic sound from the speakers in the roof above my head, especially good on " Yours Is No Disgrace". Then we waited and waited for what seemed ages, bearing in mind that in 1972 I was only 12. Any way eventually Yes came on and proceeded to provide some enduring memories. Jon Anderson saying that it was good to be back in his home town, I now live in Accrington, and know where he used to live as a lad, Chris Squire leaping up and down like a teenager and his left hand going down the fretboard of his Rickenbacker playing Yours is no Disgrace, the butterflies before Close to the Edge, the buzz when we left. Thirty years on I have got most of their stuff on cd but I can not get away with the recent stuff. I am one of those who think that Relayer was a poor album!!! 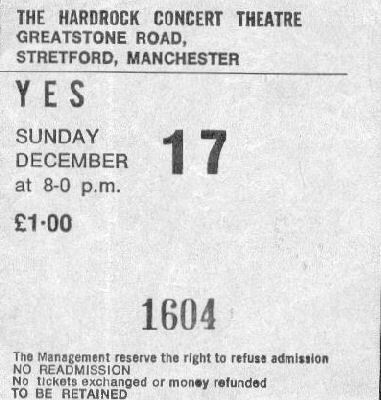 This was my first proper rock concert. I went with a friend called Tim Smith and a man I baby sat for called Frank because my other mate Keith cried off. My mates dad took us all in his car, a Triumph 2000 ! 1972 was the height of Bowie mania and a lot of the yes fans were dressed with bowie quiffs and in what I thought rather poncy clothes. I was 15 at the time and still wearing sensible jumpers!. All I remember of the concert was the power of the sound. Our seats were crap so we stood at the back and I could feel Chris's bass lines thumping into my stomach. I think I would put my love of deep bass sounds to that experience. 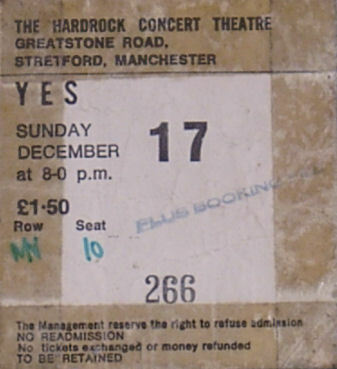 I later found a copy of "Edge" with the ticket stub from this concert stuck on the front. It is a treasured memory.